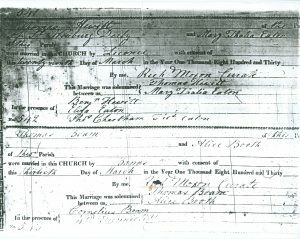 Thomas Hewitt of St. Werburg, Derby and Mary Thalia Eaton, born in Stoke Damerel, Devonshire, were married March 29, 1830 in St. Mary’s Church, Ilkeston, Derby. The wedding was conducted by Rev. Rich. Moxon, and the witnesses were Benjamin Hewitt (possibly father of the groom), Eliza Eaton (possibly sister of the bride, since the bride’s mother was not a customary witness), Thomas Cheetham and Thomas Eaton (possibly father of the bride). The bride was of St. Mary’s Parish. Stoke Damerel and Ilkeston are approximately 250 miles apart. 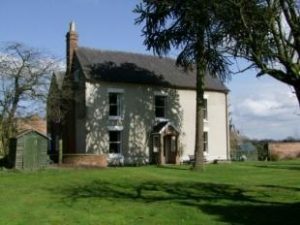 In the 1841 census the Hewitt family was living at Sutton on The Hill, Tutbury, Derbyshire at Stoop Farm, named after the stump of a thousand-year old oak on the site. This photograph was taken in 2011 when Stoop Farm was for sale. The household consisted of Thomas, age 40 (farmer), Mary, age 41, Eliza age 9, Mary age 8, Thomas age 6, Ann age 4 and Richard Eaton (banker’s clerk – perhaps a brother of Mary?) age 25. 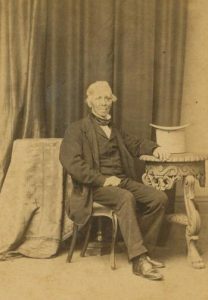 Thomas Hewitt was listed as farmer for the estate of Henry Chandos Pole, Barton Blount, in the 1857 Directory of Derby. He owned and farmed a large number of plots. The following diagrams were provided by an English cousin-of-a-cousin. They indicate the plan of the Township of Thurvaston, Osleton and Cropper in the Parish of Sutton on the Hill in the County of Derby. 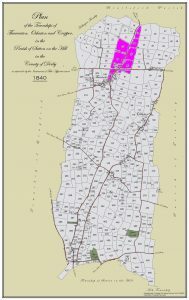 The purple lots indicate owned and the yellow lots indicate owned and farmed. An older son, Thomas Eaton Hewitt, born in 1834 was an apprentice to Bemrose in Derby in the 1851 census. Eliza, the oldest daughter, was already married to George Goodwin. In the 1871 census, only Ann age 34 and Catherine age 27 are still living with the parents in Quarndon, Derbyshire. These photographs are purported to be of Thomas Hewitt and Mary Thalia Eaton, sent by cousins in New Zealand. Thomas Hewitt died May 31, 1877. As indicated on the National Probate registry, the will had three codicils (contents unknown). Mary Thalia Eaton Hewitt died 23 March 1885 aged 83 years. In the time between Thomas’ death and her own, she set up households with her two widowed daughters and their families, Mary Hewitt Bryer (children living with her Ellen, Alfred and Edward) and Sarah Hewitt Walker (children John, Annie, Alfred and Edward), and daughter Catherine who was unmarried. The 1881 English census shows them more-or-less living in a row beside each other. 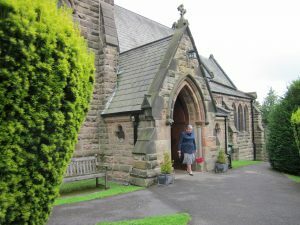 Thomas Hewitt and Mary Thalia Eaton Hewitt are both buried in St. Paul’s Church, Quarndon, Derbyshire. Their graves were no longer marked. 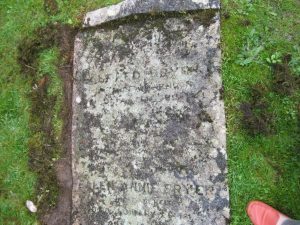 The graves of Alfred Bryer and Mary Hewitt Bryer were located, as well as the grave of Ellen who died at age 15. Eliza (1831-1891) married George Goodwin and they lived at Kedleston, Derby, where George worked for Lord Scarsdale. 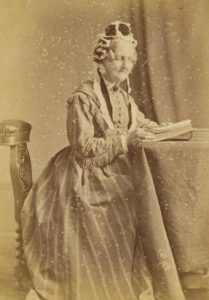 The photograph is of Eliza Hewitt Goodwin, Benjamin Hewitt’s oldest sister. They are both buried in the Kedleston churchyard. Seven of the nine Goodwin children immigrated to Australia and New Zealand and this photograph was sent by a cousin in New Zealand. An article written by a granddaughter, Kathleen Goodwin of Cambridge, NZ details how all the families did, in particular two brothers, Robert and George. Mary ( 1834-1907) married Alfred Bryer (a few years younger than her) in 1864. He had been taken on as a farmer’s pupil in 1851 on his uncle John Bryer’s farm of 380 acres in Markeaton. Mary and Alfred had three daughters in the 1871 census; Mary, Louisa and Ellen. Two sons, Alfred (Junior) and Edward Trafford were born before Alfred Senior died in 1876. He left an estate of under 2,000 pounds. Mary ensured her children were well educated; in the 1891 census daughter Mary was a governess, Louisa was a student of languages and Alfred was an architect’s pupil. Edward had attended Trent School and eventually immigrated to Canada where he married and lived in New Westminster, BC. Ellen had died at Crossley Orphan Home and School, Savile Park, in Halifax, Yorkshire in 1884 where she and Louisa were students. Louisa was a missionary for the Church of England Zemana Missionary Society [CEZMS] in China for over 30 years.She made at least ten cross-Atlantic and cross-Pacific trips and in 1938 immigrated to New Westminster, BC where she lived with her brother Edward and his wife Carrie. 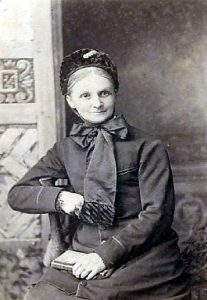 A large collection of her writings is available through the University of Birmingham Archives, where the following photograph of her was located in her missionary days in China. The CEZMS missionaries adopted Chinese dress, and Louisa translated the Bible into two Chinese languages as well as establishing two schools for girls. She visited her cousin Edith Hewitt Milligan at Bon Accord in the 1940s . Sarah (1840-1924) married Matthew Walker and they had five children (John, Matthew, Alfred, Annie and Edward); . Her sons Matthew Walwyn and John became very well known pudding and preserve manufacturers. A 2008 newspaper article credited Sarah as the recipe originator. “Matthew Walker, a farmer’s son, began by producing preserves and Christmas puddings from his mother’s recipes. He then sold products through a friend’s grocery store and opened a factory in Derby in 1899. It moved to its present location in 1967. Today, 280 varieties are made there.” Matthew Walker Puddings was sold by the family in 1967. The two youngest children of Sarah and Matthew Walker were Annie and Edward. Annie moved to New Zealand with her husband John Moody Denston Wilson in 1903. In the same year, the extremely promising career of her brother Edward ended when he died in Kenya. Thomas Eaton Hewitt (1835-1909) became a printer and bookseller and had left the family home by the 1861 census. He was widowed twice and was not as financially successful as his sisters, leaving a small estate of under £400. Thomas Hewitt and Mary Thalia Eaton Hewitt are both buried in St. Paul’s Church, Quarndon, Derbyshire. Catherine Hewitt, the last surviving child of Thomas Hewitt and Mary Thalia Eaton, died 9 January 1918 in Uttoxeter, Derby and left an estate of £2764. The executors of the will were Matthew Walwyn Walker fruit preserver (probably a nephew) and Ebenezer Eagle grocer. Apparently the money (about $140.00 in 1918 currency value according to the New Zealand cousins) was divided among the nieces and nephews who numbered about twenty. Jack Milligan (1908-1977) remembered some of “Aunt Kate’s money” coming to the family in Bon Accord. The legacy was also mentioned by one of Eliza Hewitt’s grandchildren who had immigrated to New Zealand: they used the money to take a trip around New Zealand. Mary Ann Brindley was married to Benjamin Hewitt on January 12, 1870 in the Parish of Aghancan, King’s County. The same residence, Summer Hill, was listed for Benjamin and Mary Ann on the marriage license. The witnesses to the marriage were Robert Brindley, probably Mary Ann’s brother, and Stuart Purrets. According to the Hewitt history in the Leaves of Yesteryear (1969) Benjamin decided to come to Canada after going around the world twice. Benjamin Hewitt did serve in the Irish Merchant Navy. Records of four voyages have been located: in 1873 and 1874 he was a fireman on the S.S. Era and the voyages were all to Bordeaux, France. In 1877 he sailed for a longer time on the Aurora as a fireman, and the ship had permission to travel from the United Kingdom to the Azores and Canary Islands, the coast of Morocco, and the Mediterranean, Black, and Baltic Seas. When Walter Brindley died in 1883, Benjamin Hewitt was listed as the informant of the death, living at Knockfinn which was also his address on the ship registers. Mary Ann and Benjamin Hewitt came to Canada via Liverpool from Ireland in 1892 with six of their seven children: Geoffrey (20), Albert (18), Edith (16), Alfred (possibly known as Bryer, age 14), William (11), Ernest (9) and Reginald (5). They travelled on the S.S. “Lake” and Benjamin’s occupation was mechanic. Their oldest son, Walter Thomas Brindley Hewitt, had left for South Africa with his Brindley uncles a few years earlier. Originally the family planned to go to Vancouver and on to California before deciding where to settle. When they arrived in Calgary the C.P.R. had just been punched through to Edmonton and they came to Edmonton instead. The Edmonton Bulletin of May 9, 1892 announced the following arrivals by train to the Jasper Hotel: Benjamin B. Hewett (sic), Geoff F. Hewett, G. Fletcher, England. Benjamin Hewitt departed May 11 and the Bulletin announced the arrival of Alex S. Florence, Albert Hewitt, John Connell, J.W. Clutters, wife and family, England on May 16. The arrival of Mrs. Hewitt and family from Calgary was noted on June 30. The Bon Accord history Leaves of Yesteryear (1969) by Jean Chubb and Hilda Milligan states that the Hewitts stayed on the site of the Little Mill while their house was being built by the Verreau Brothers from lumber drawn from Edmonton. The Hewitt homestead at SW 6-56-23-W4 was a two storey dwelling of lathe and plaster with a living room, dining room and kitchen downstairs. There were three bedrooms upstairs and a large veranda on the south and east sides. It was the first frame house built on the north side of the Sturgeon River. The house was a stopping place for many travellers coming and going to the north: “Mrs. Hewitt never turned anyone away, even if all she had to offer was bread” (Chubb and Milligan, p. 266). The Hewitts purchased a herd of purebred cattle which they used to buy services. “Three exceptionally good cows, a calf and a very young steer” were used to pay George Mulligan for cutting Benjamin Hewitt’s grain crop in 1894 (Chubb and Milligan, p. 311). 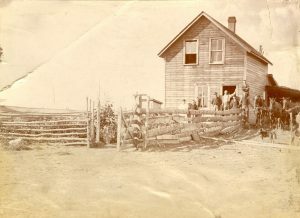 Ernie and Rex Hewitt were the first children to go to school at Sunnyside in 1894. In the 1901 census of the Northwest Territories, Alberta – Creuzot, Mary Ann was listed as head of household. Benjamin was listed as “alienation mental” (the census was conducted by Alphonse Lamoureux in French). Benjamin Hewitt died in Brandon, Manitoba on August 19, 1901, aged 59. The cause of his death was blanked out on his death certificate. 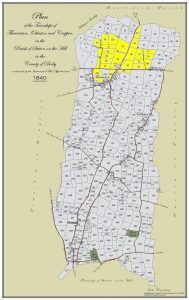 His will was not probated until 1923: six children are listed as beneficiaries. Richard Eaton Hewitt might be the same person as Ernest Hewitt. Mary Ann died in June of 1902, age 58 years and 1 month. She had lived long enough to see her daughter Edith Mary Thalia married to John Milligan the previous January. Her final illness occurred when the Sturgeon River was in full flood. 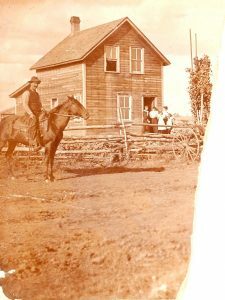 A neighbour forded the river on horseback to get Dr. Turner from Fort Saskatchewan, but when they returned three days later, Mary Ann had died. At the time of the funeral, the coffin was nearly carried away by the fast flowing river, although it was resting on planks on top of a wagon box. Mary Ann was buried in the Anglican graveyard at Sunnyside, south of Bon Accord. A grave marker in the Sunnyside cemetary has the names of William and Benjamin on it, although Benjamin may not be buried there. Geoff, Ernie, Bryer, Al and Rex settled on homesteads, or acquired land around the homeplace. William (Bill) was killed in a hunting accident at the age of 12. 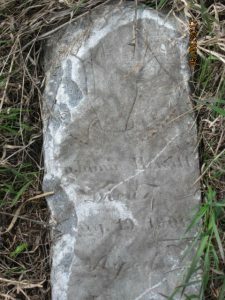 A gravestone for William and his father Benjamin can be seen at the edge of the Sunnyside Cemetery. Geoff married Winnifred Morris and they had three children, Edith, Edna and Reginald. Bryer married Ethel Morris and they had two children, Doug and Gladys. The name Bryer is possibly from Benjamin Hewitt’s sister Mary who married Alfred Bryer, and who had a son named Alfred Eaton Bryer. Albert, “Uncle Al” married Margaret Watt and had three children, Thalia, Albert John Robert and Jean. Ernest married Agnes Milligan, sister of John Milligan and had two daughters, Marion and Agnes Victoria [Aggie]. Agnes died at Aggie’s birth. Ernie married again to Molly Robinson and they had six more children: Norman, Bobby, Evelyn, Lloyd, Walter and Ruth. Edith and John Milligan had eight children (Molly, Mardie, Jim, Jack, Thalia, Jean, Sadie and Geoff). They adopted Aggie at birth and raised her as a Milligan. Rex married Amber Brown and had two sons, Marshall and Aubrey.